In quick time, areas of forest on Vancouver Island are cleared - then from remote locations the logs are dropped into the sea to be rafted up and transported to a processing plant. Logging has been the mainstay industry on Vancouver Island for over a century with new methods of felling and transportation being developed on a regular basis. Large rafts of logs or barges laden with logs are common sights in the straits and waterways off Vancouver Island being towed to a far away destination. There is a lot of controversy surrounding the logging industry on Vancouver Island which has seen old growth forests demolished leaving huges gaps in the landscape allowing for run off and leaving a multitude of animals without habitat. Aerial of a log raft in the waters off Vancouver Island, British Columbia, Canada. 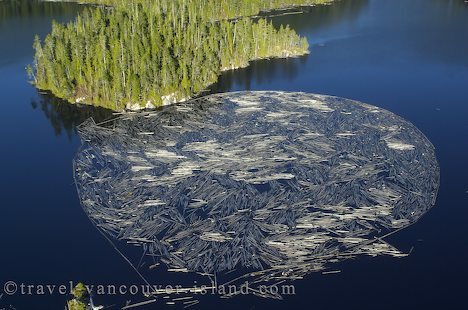 Aerial image of a log raft, transportation method used in the logging industry of Vancouver Island, BC, Canada.